It’s turned decidedly more wintry in these parts lately, with biting wind and low temperatures. It’s a good thing, so, that I finished this up recently. 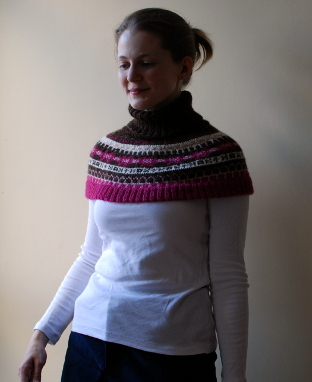 I’m not sure exactly what got me on to the track of wanting to knit something like this but down the rabbit hole I went. The pattern I used was September Set, or 150-19 from Drops. The pattern also includes a matching beret and mittens. I used Debbie Bliss Blue Faced Leicester in DK from This is Knit. I decided to change the grey in the pattern to brown and matched most of the other colours to the pattern. If I remember correctly, I got two balls of the brown and one each of the other colours (dark pink, light pink, white). I ended up needing just a tiny bit more of the dark pink and light pink and so now have more than enough to make a matching hat of some description. 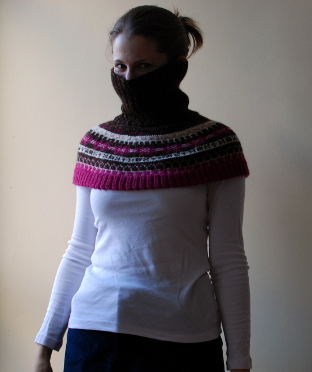 What I really like about it is a slight adaptation I made, which was to knit the ribbed neck until I ran out of yarn. It is super long and very, very snug. I don’t like a draught on the back of my head so I often tuck my hair into a scarf and pull it right up to my ears. I blocked this by steaming it with the iron. It worked surprisingly well. 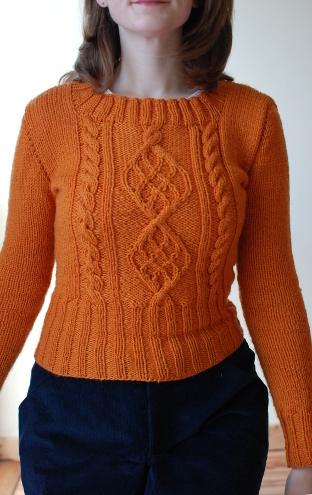 The only thing I regret is perhaps not using a slightly bigger needle size – colourwork is pretty inflexible when it comes to stretching over the shoulders and sometimes this rides up. It’s not grave and certainly something I can live with. I think I used a 3.75mm. I probably should have used that for the rib and gone up for the colourwork. Oh well! It is still toasty and warm for weather like this. This technically isn’t new. I made it last winter but never wore it as I was unhappy with a few things. Firstly, I made many errors in the front chart. Then, the sleeve caps were both different and misshapen. I finally got around to ripping it out and reknitting it. 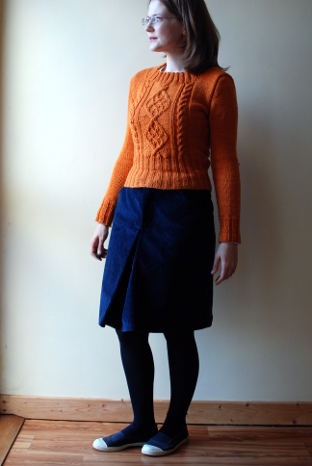 The pattern is Chuck by Andi Satterlund (Ravelry link). I was more attentive second time around and am happy with the result! As you can see, it’s fairly cropped so is better with high-waisted skirts and dresses than trousers. Managed to get those cable crosses right this time! 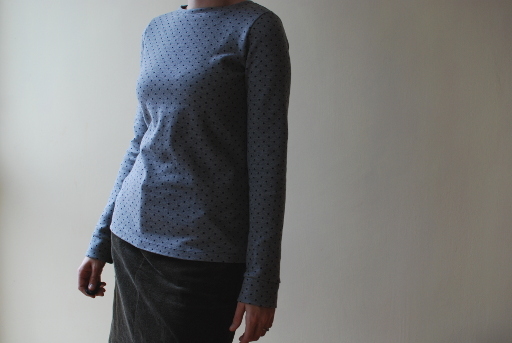 Overall, the pattern is clear (when you actually look it) and it’s a pretty quick knit. I mentioned the other day when I showed my first Moss skirt that I’d already made another. Well, here it is. I love the shape of the original but riding a bicycle in it is a precarious situation. 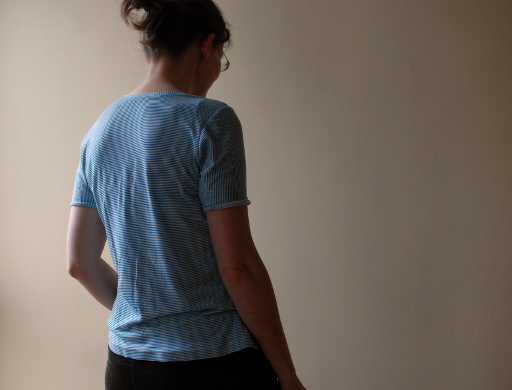 I added a pleat both in the front and back. I went for the very plain and simple way of adding pleat, namely cutting an extra rectangle and folding it into position. If I’d really thought about it, I could have cut the pleat in a way that it was mostly part of one side of the front, like a kick pleat. Never mind – it worked out perfectly fine. It was a good lesson in remembering to consider all options first. You may notice that the front pocket protrude a little. This is on purpose, to make them extra hand-friendly. One of those neat little additions that endears Grainline patterns to their makers! As before, I used scrap fabric for the facings and pocket linings. 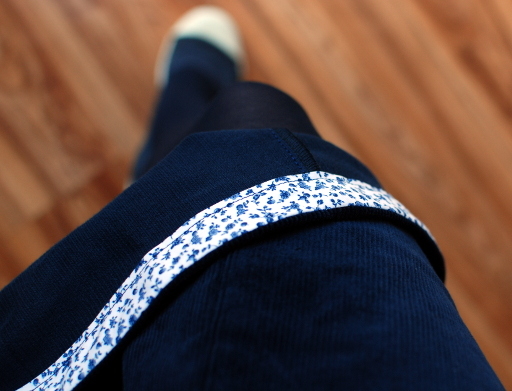 I finally got to use the flowery bias binding I bought for this very project. I bought it at least six months ago. 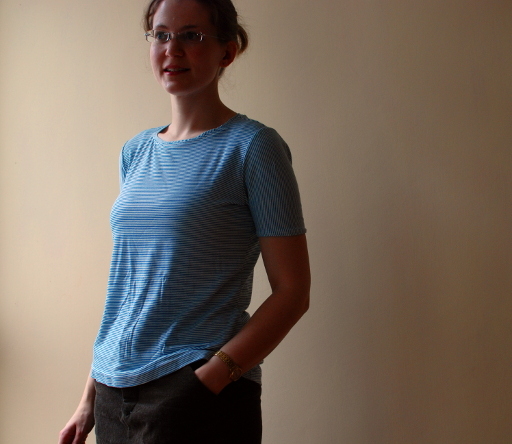 A quick round-up: the pattern is the Moss mini skirt. I used navy cord that I bought at the 2012 K&S show. I have been waiting and waiting and waiting to use this. I finally realised that there is no situation imaginable where I have too many navy skirts. 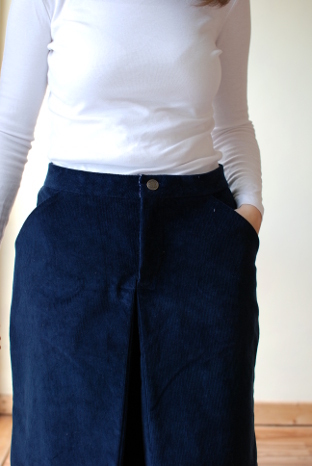 This was brought on by washing my navy wool/cashmere skirt and finding myself suddenly stumped for outfit ideas. Clearly, I wear it more than I realised. Anyway, this has filled the gap. The bias binding, I found at Rubanesque. I haven’t been in a while but last time, they still had a lovely, varied selection. It has been a long time since I shared any knitting here but that’s not to say I haven’t been doing any. The truth is that even though I still knit every single day, a lot of it is pretty perfunctory stuff. And I suppose one must face the fact that, after many years of sweater knitting, you don’t need that many jumpers. I wear handknits constantly (particularly Salina, my red hoodie, my Graystone sweater…) but haven’t felt a particular need for anything new now in a while. I cast on for a Larch cardigan last weekend in a teal merino. At the moment it’s just a big square but I’m hoping to get to the armholes over the next few days. It is perfect tv knitting. 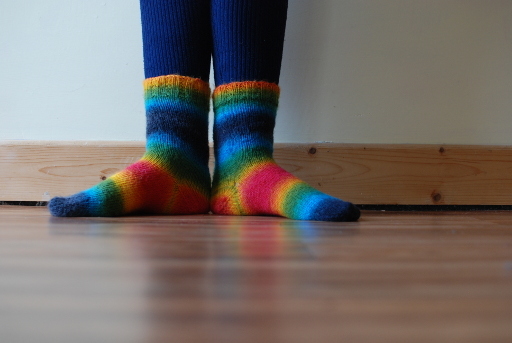 Otherwise, I’ve been knitting socks. Lots of socks. 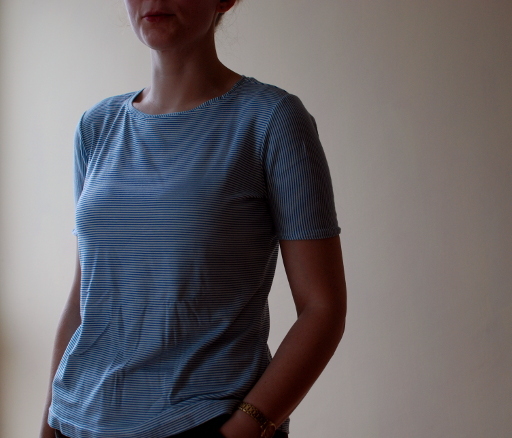 For these I used Katia ‘Darling’ from This is Knit (see here). I bought two balls but only used maybe a third of the second one. Obviously there was a bit of wastage (sort of) by making them as identical as I could but I have very small feet so I knew I had yarn to spare. I tried out an afterthought heel on these and it worked really well. 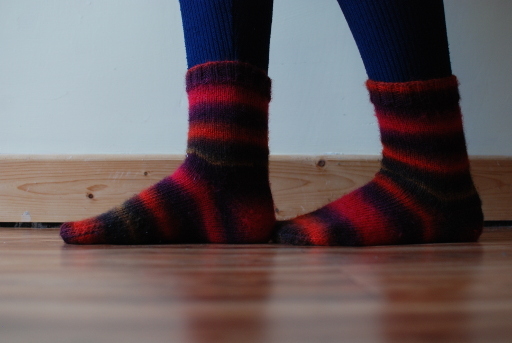 It meant I could just plough on knitting my tube and think about the heel much later. 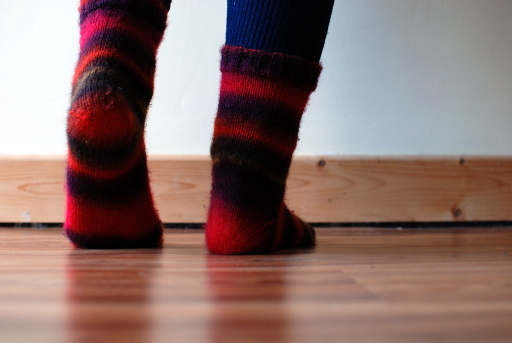 I think Elizabeth Zimmermann talks about it in at least one of her books, and I found actual numbers and directions in Lucy Neatby’s ‘Cool Socks Warm Feet’. 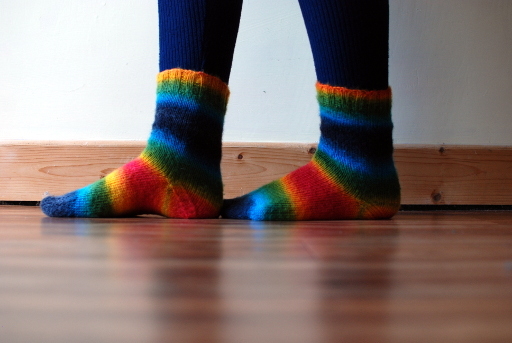 I couldn’t knit just one pair, so I tried a different colourway. I love these! They’ve already gone a bit bobbly from being worn around the house. The downside to the afterthought heel is that without reinforcement (like nylon or whatever), I doubt they’ll hold up to the test of time. We’ll see! 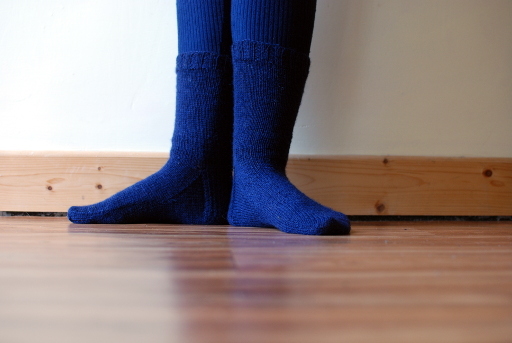 I finally finally finally knit myself a boring plain pair of socks. Need I mention that these are the ones that get the most wear?! You’ll have to take my word that they are, in fact, the same length. Have a great weekend, one and all!